The NeuYear calendar is laid out so you can see the whole year at a glance. This makes planning easier as you can see your whole year as you’re writing in key dates and times. There’s no having to flip through a paged calendar and backtrack to insure you’re not duplicating events over multiple months. You get a HUGE calendar. Clocking in at 27″ X 39″ this bad boy is big. You’ll have more than enough room to write events in the daily squares. NeuYear has also made the calendar two-sided. Why’s this important? The answer is two-fold. Your office may not be setup to accommodate the horizontal calendar. If that’s the case, there’s an easy fix. Flip the calendar over and you’ve now got a vertical calendar. The other benefit is choice. 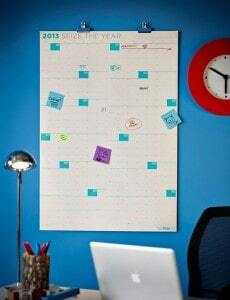 You can have a vertical calendar or a horizontal calendar. I personally chose to hang my NeuYear calendar in the horizontal position. You have the choice between a dry-erase or un-coated version. The dry-erase version was the choice for me. Dates can change and I like to have the option to go back and edit my calendar. You may have more dates that are set in stone. The un-coated version may then be for you. The calendar has a slight off-white color. This is great for the eyes. Rather than turning to look at a calendar that is blazing white, you get a soft white color that is easy on the eyes. I really like the NeuYear calendar so far. That doesn’t mean there’s not improvements I would like to see made to the calendar. One of the features is the no gaps between months. This helps the year flow together in a cohesive unit. Yet I would like to see this slightly altered in future versions. Maybe not a complete separation of months but an outline around each month. With this improvement, you could see the whole year and individual months much easier. My calendar came with four pieces of 3M double sided tape. When I hung the calendar on my wall, the tape didn’t hold the calendar up. Within a half an hour the calendar wound up on the floor. I could see larger pieces of double sided tape increasing the likely-hood the calendar will stay on the wall. While there are areas of improvements to be made to the calendar, there is definite value in the NeuYear calendar. The layout is gorgeous, the quality of the calendar is top notch, and you’re easily able to edit and change your scheduled events. Want to get your hands on a NeuYear calendar and receive 30% off? It’s simple. Click here to go to the NeuYear website and place an order. At step 2 of the checkout, enter your special discount code “Lalonde” when it asks you for your discount code. The discount code is valid until December 31st, 2012. So if you’re thinking of purchasing a calendar, be sure to do it before then. Question: When planning your year, do you prefer seeing the whole year at once or doing once month at a time? Please share your thoughts in the comment section below.